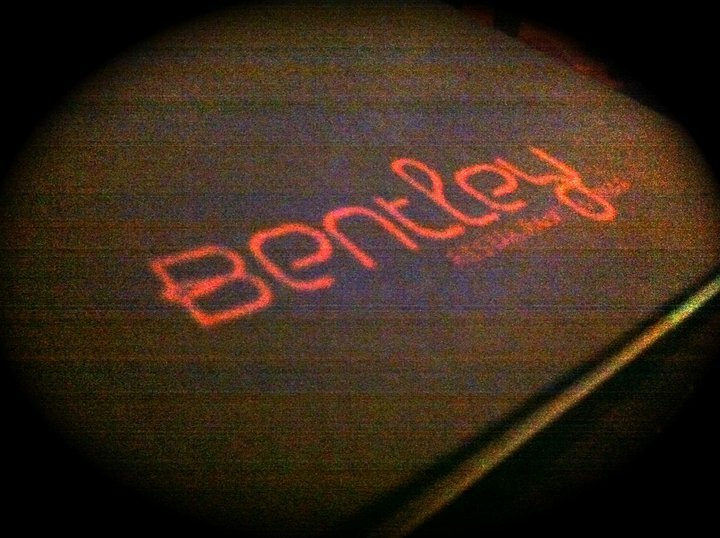 Bentley Restaurant has moved to a new venue in Radisson Blu Hotel. This is our anniversary week and we are in for a treat. We had the honour of experiencing Australia’s two-hat restaurant, Bentley Restaurant of Surry Hills. 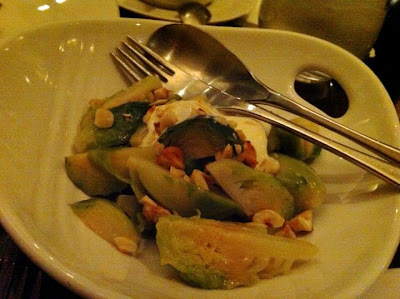 Once we stepped into the restaurant, it was a totally different experience. Instead of spotless white tablecloths and brightly lit rooms, we were taken to sort of dark bar décor with wooden tables and a simplistic table setting. We started off the night with this ‘Appetisers to share’. 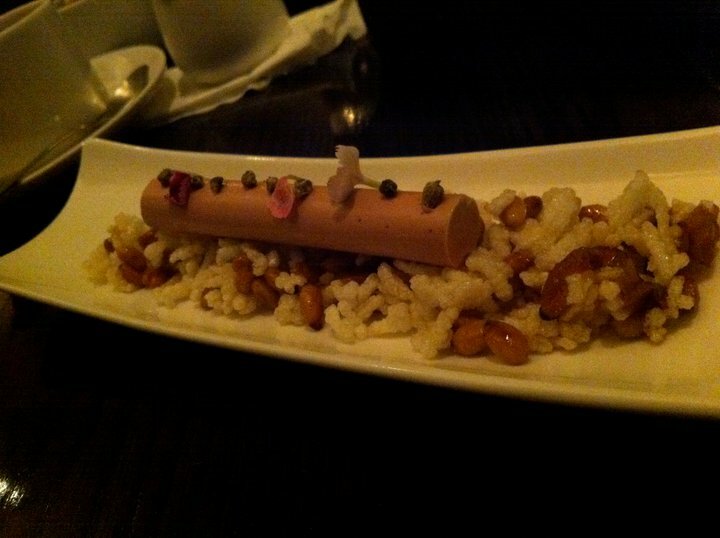 Beautifully decorated Foie Gras with Rose Petals ensured the night started off with a bang. 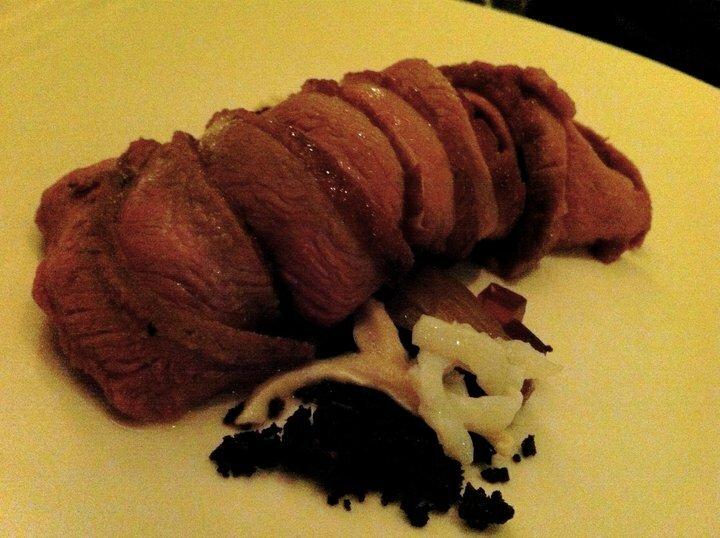 The combination of strong duck flavour was complimented by the sweetness of the raisins. It was the ‘OMG-I-can’t-believe-it’s-very-good’ dish of the night. The Entrée for the Mrs and another nicely arranged. We weren’t really paying attention on the details at first and thought the sweetbread could’ve been a brain. However, the overall combination was lovely and the sauce’s bitterness was just the right amount. Unfortunately this one was less appealing, presentation-wise. My wife reminisced the sauce to be the same as Indonesian traditional’s pepes, which I wasn’t really fond of. 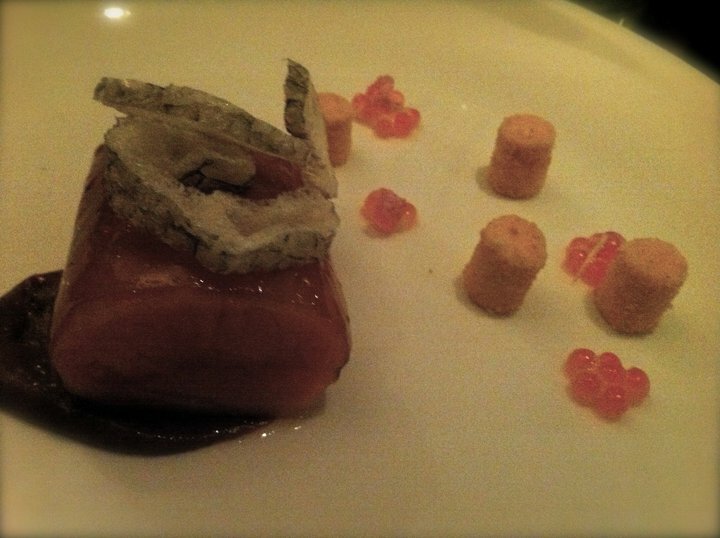 The trout had a really nice texture and the mousse was really soft. This was the side dish for the night and it added a little green in what otherwise be a ‘meaty’ night. The spatchcock was roasted to perfection. 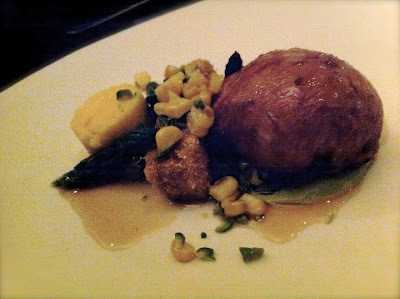 The polenta and pistachio further enhanced this Game bird’s taste with a hint of crispy texture from one element on the dish I couldn’t quite work out. I always enjoy a good duck and – I know it could be disastrous if not handled properly – this one was definitely one of the good ones. The duck was really tender with a hint of sweetness. 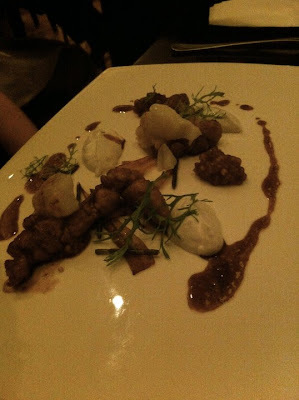 I’d have to guess that the black grainy thing was the mushroom, but it was very tasty. The combination of the three key ingredients created a unique experience. 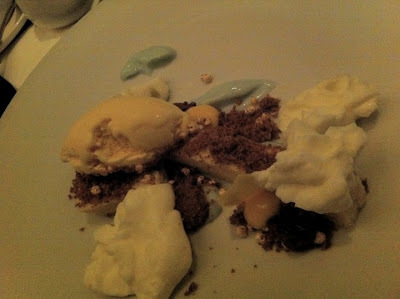 There were quite a few elements on this plate, the cheese mousse, the sweet and sour passion fruit, the cake, the granules, and the sweet green sauce. Our opinion was divided on this one. I think that the mousse was perfect without the overpowering taste of passion fruit, whilst she thinks that the passion fruit actually balanced the strong goats cheese’s taste. So you have to try and experience it yourself. 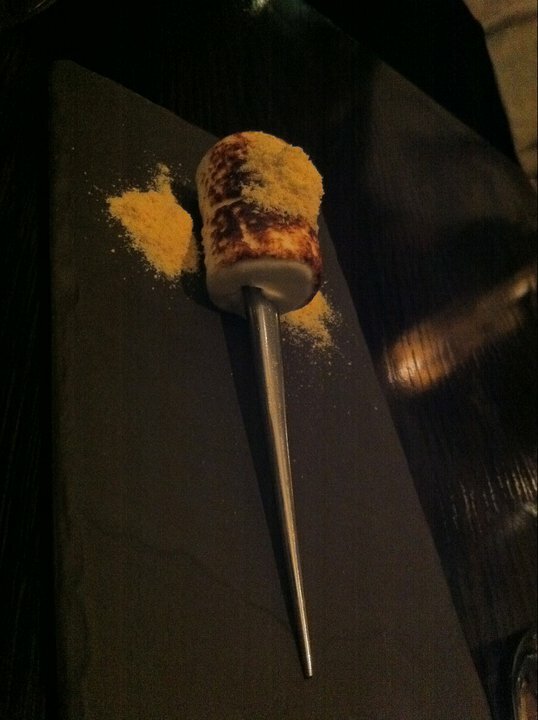 Technically, it was just a well-burnt marshmallow on a stick, but they presented it in a nice board and a nice-looking stick with malt powder. Bentley certainly had the complexity of a fine dining restaurant. Every dish was presented beautifully and tasted wonderfully. 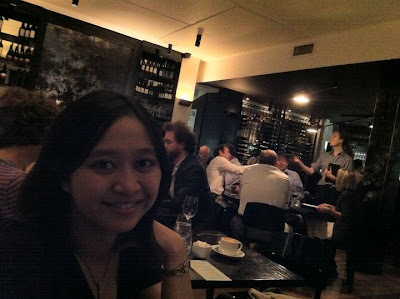 Love the different ambience and unique décor of the restaurant. 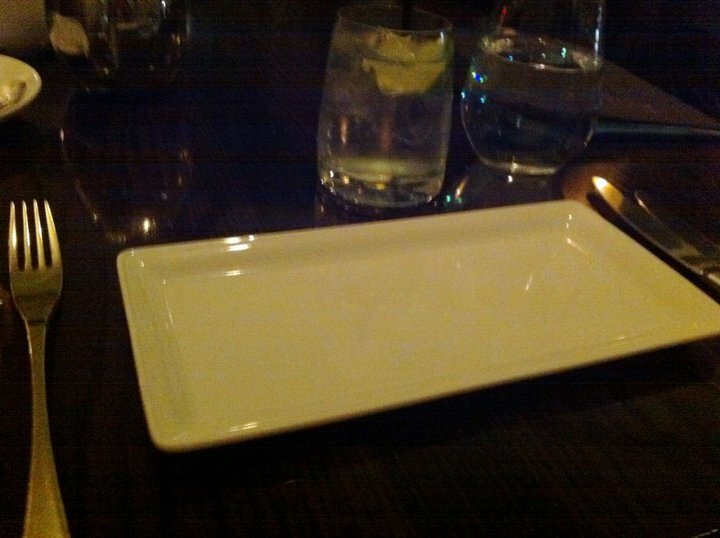 Unfortunately the share plate, Foie Gras, was much better than the rest of the night. 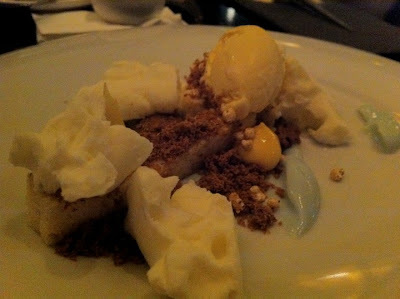 There is also a degustation menu that they offered for $120, but I found it disappointing since it only listed one main and 4 entree from the regular menu, which is not an incentive for me to try. Surry Hills is a suburb full of exciting restaurants. However, you are wise to check the reviews on these restaurants or you might be left with a high bill and feeling disappointed.